By John Lamoureux, Advanced Sandjacking, Inc.
One of the many responsibilities of public works managers is to maintain the concrete features of the properties for which they are responsible. These include sidewalks, curbs, steps, garage or basement floors, aprons adjoining driveways, patios, and recreation areas. When any of these are cracked, uneven, broken, sunken, or misaligned, it’s a maintenance issue that needs to be addressed. There are three options to consider: mudjacking, sandjacking, and replacement. Because of the high moisture content in mudjacking material, evaporation is inevitable. Since the holes weaken the concrete, cracking is common especially under high traffic areas like driveways and garage floors. If a mudjacking slab settles, it usually doesn’t do so in the same way as before. Mudjacking a slab more than once often creates a need to replace the slab. Engineers define mudjacking as “pressure point lifting” and consider it to be a temporary repair. On average, mudjacking lasts one to five years, depending on soil conditions. It has an overall resettlement rate of around 85 percent. 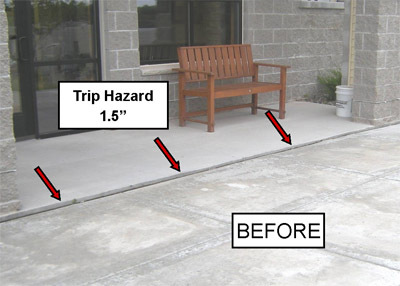 On sidewalks that are 5-6 feet wide with access on both sides, braces and hydraulic jacks are used to lift and re-level the concrete. A dry (2 percent moisture) limestone sand is blown in from the side for even distribution to support the slabs without leaving any voids or drill holes. Sandjacking material achieves a 95-99 percent compaction rate, making it less susceptible to movement than wet mudjacking material. If access to both sides is not possible, a minimal number of dime-sized holes may need to be drilled and then camouflaged with a color blend to match the surface. Alongside steps, dirt is added if a sloping grade has washed out and polyurethane foam is sprayed to prevent washout and re-settling. If drill holes are needed on stamped or decorative concrete, they are made on the seam or joint so it is easier to patch. The landscaping next to any concrete piece being worked on is restored as part of a sandjacking job. If a slab is broken in two or three places or has multiple cracks like a jigsaw puzzle, it should be replaced. This is especially the case if it is over 25 years old, has been mudjacked already or has surface deterioration from salt. Often, some sections need to be replaced while some can be sandjacked so a combination repair is commonplace. When a facility manager sees a difference in height between concrete slabs or any settling or moving, it’s a sign that action needs to be taken. A school could possibly be sued if a visitor or student trips over cracked or uneven walkways or steps, so there is an urgency factor to consider. Also, it’s essential to direct rain away from building foundations, so adjoining cement pieces need to be properly sloped to prevent water from collecting next to a brick, stone, or foundation wall. 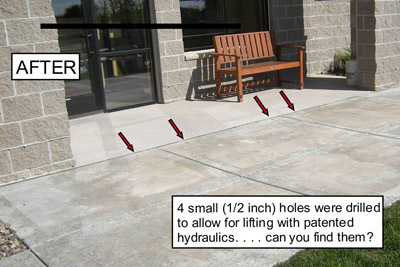 If cement slabs separate, the control joints between them open, or there is a gap between a sidewalk and the back of a curb, it’s time to gather repair bids and plan a repair or replacement budget accordingly. While a homeowner who is planning to sell in a year or two may choose mudjacking as a short-term solution, professional facility managers typically look for a return on investment that precludes the same problem having to be repeatedly addressed. Especially for public facilities with high traffic patterns, sandjacking provides a value and reliability factor for an array of concrete repairs. What are the ways to extend the service life of your concrete? Control joints should always be caulked and sealed to prevent surface moisture from getting under a slab, thus causing frost heave or settling. Caulking of joints protects the control joints and edges of concrete slabs, reducing damage from snow removal. 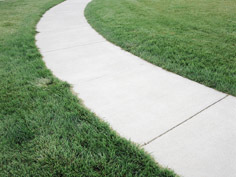 Directing water away from sidewalks reduces soil saturation and heaving. Avoid burying drain pipes beneath exterior concrete. Directing water under exterior concrete should include the installation of smooth, rigid PVC pipe – never use corrugated or perforated drain tile. Advanced Sandjacking, Inc. has worked with public sector as well as commercial, industrial and residential clients on projects such as raising concrete floors, repairing sidewalks, and filling voids around entryways. For more info, visit: www.advancedsandjacking.com.